NEW YORK — Forget dreaming of electric sheep. Robots first need to figure out how to imagine themselves. One New York robot has done just that. 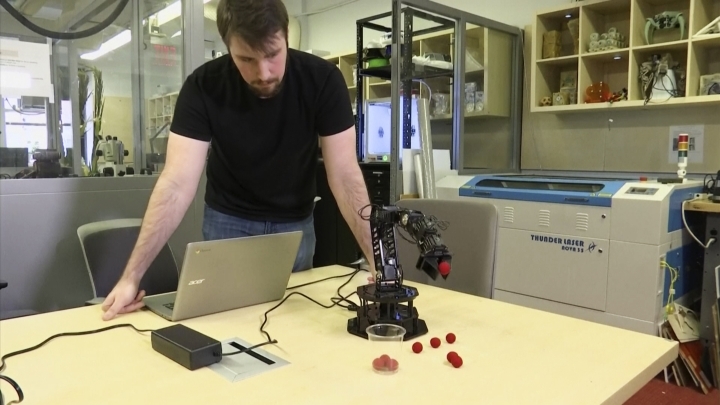 It's learned that it's a robotic arm using a process of self-simulation. Columbia University engineers have given the robot the ability to model itself without prior knowledge of physics or its own shape. The robot starts out moving randomly, but over time learns enough about itself to be able to perform tasks and even detect if it's been damaged. Columbia mechanical engineering professor Hod Lipson says "self-awareness is the Holy Grail" of autonomy. He says there are ethical risks in gifting robots with self-awareness but also many benefits, including adaptability and resilience. The research was published last week in Science Robotics.